Calling all Ateneo alumni! Do you have creative pieces that have been locked up in your drawers and hidden hard drive folders, waiting to be dusted off and shared with the world? 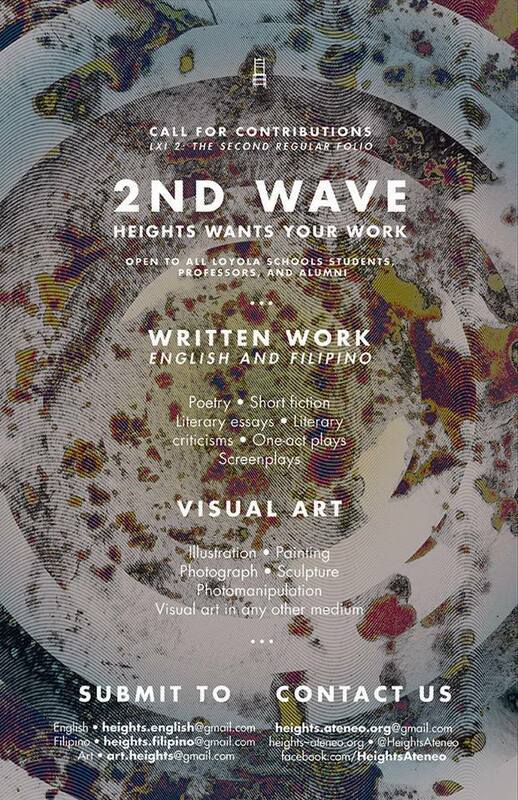 Heights has an open call for submissions until January 4, 2014–and we can still be part of it! You need not be a Heights member to contribute. Heights accepts contributions year-round; however, there are deadlines for special issues (e.g. Seniors Folio). You may contribute more than once. All submitted and solicited works undergo staff deliberations. Works are published based on merit. The author’s identity is kept confidential. Write SUBMISSION as the subject of your e-mail. Attach your work to the message. For written works, there are no limitations for the number of pages. Artworks should be in CMYK format with a resolution of 300 dpi. If you feel the need to include an artist’s statement, please do so. Include a short bio-note or write-up, and your contact details. Disclaimer: I am neither a member nor an alumna of Heights, but I’ve been a fan of their work through the decades and just want to share the message. Please direct your queries to the email addresses above. Thanks!